Part of UAE NOW – a section of the fair that put a spotlight on grassroots initiatives based in the UAE. 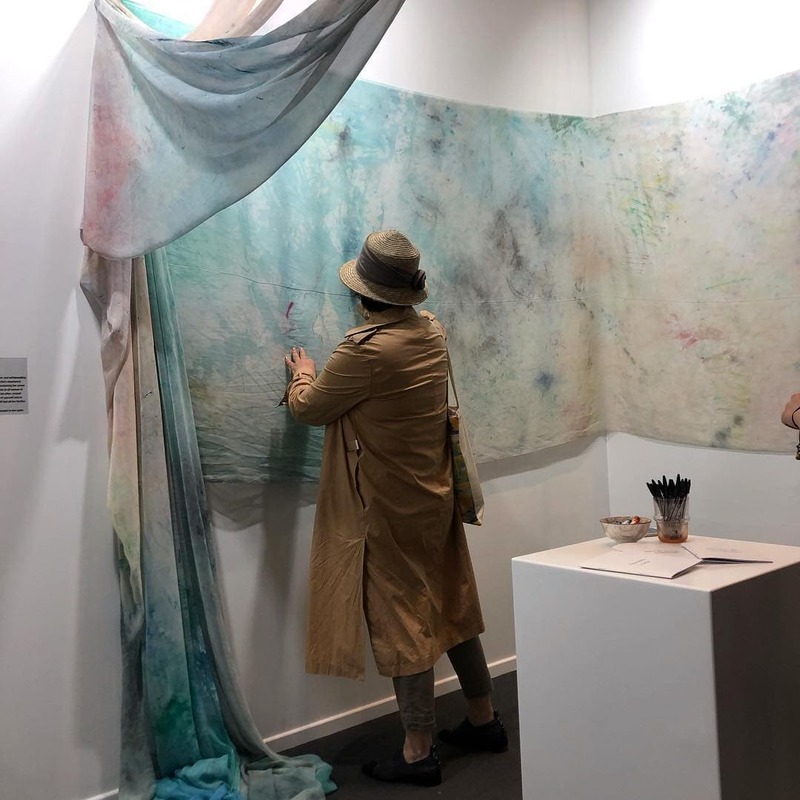 Banat Collective’s Sara bin Safwan filled her booth with a fabric work by Jana Ghaylani and short film from Sarah Alagroobi. 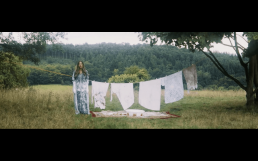 Jana’s work Untitled (Traces of Resilience) invited viewers to draw on fabric, creating a sense of community and unity, whereas Sarah’s Ivory Stitches and Saviours is a reflection of her experience working as an Arab artist in a Western environment. From Beirut to Dubai, Hafez Gallery has consistently impressed me at every art fair we both have attended. 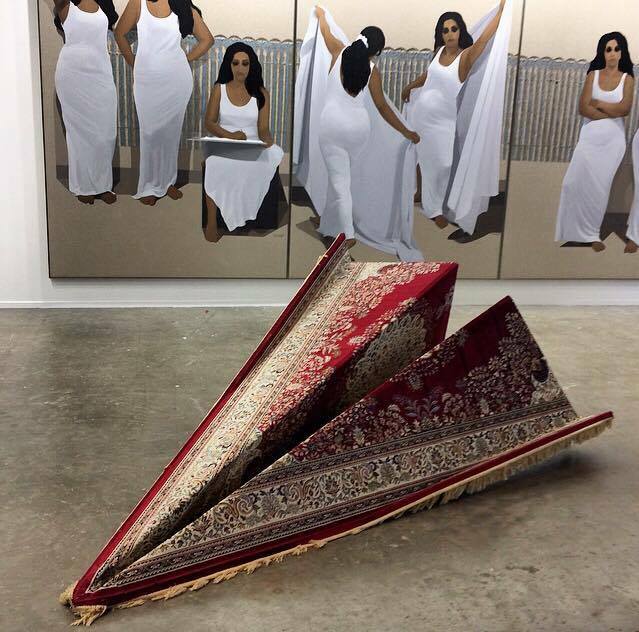 Positioned in front of Ibrahim El Dessouki’s stunning triptych The Seventh Day – a huge painting made up of seven beautiful women dressed in white – Ali Chaaban’s carpet 12pm Class captured everyone’s attention in its carpeted paper airplane form. 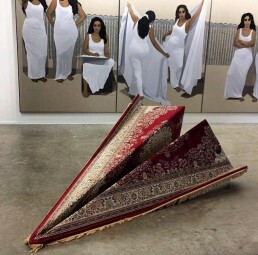 This stunning marble work at Canvas Gallery was made by Lahore-based artist Hamra Abbas. Having lived in the US, she moved back to Pakistan especially so she could work with the material. 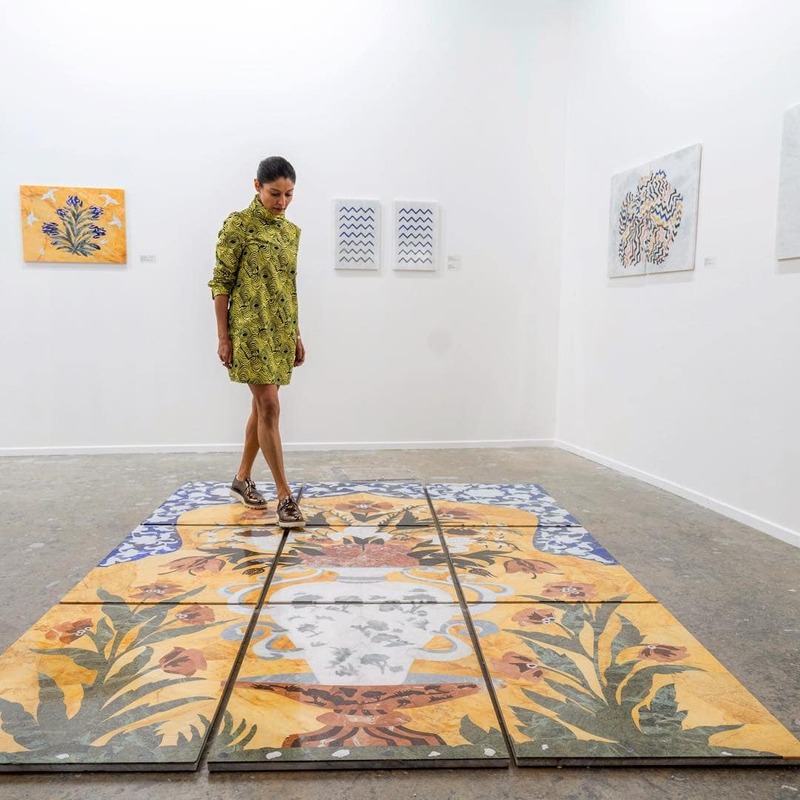 “Gardens in which Rivers Flow” was inspired by 17th century frescoes from Lahore, together with the influence of Sol LeWitt. Viewers had to stop themselves from reaching out at touching her works! 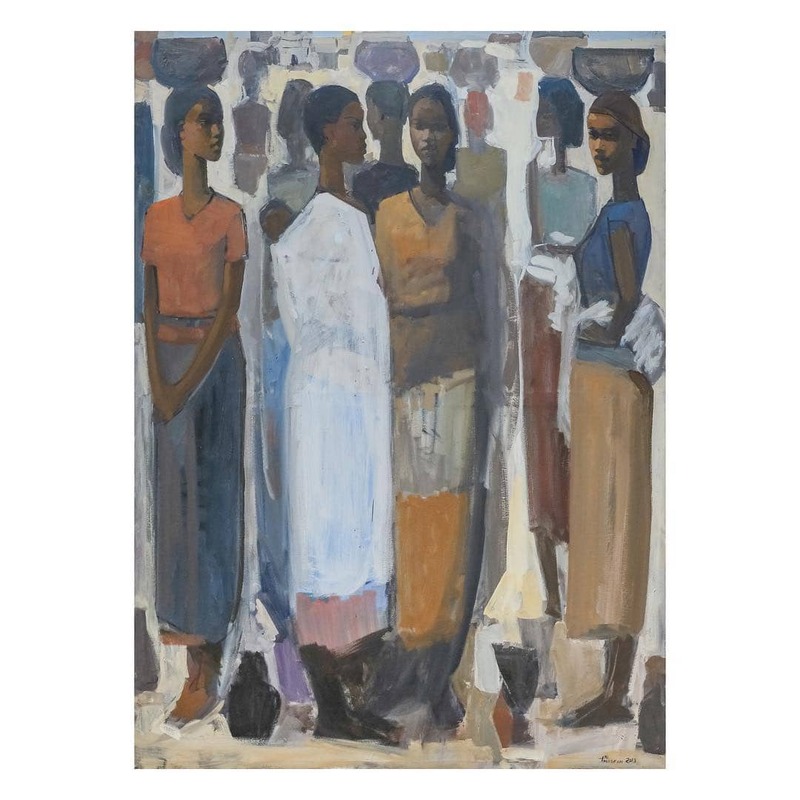 Augustine‘s images were made in response to the loaded question of ‘Where Are You From?’ specifically in the context of being from the Philippines and living in the UAE. His series of photographs titled Cooking Adobo in the Hea(r)t of Dubai, preserves the sense of home, cooking for one and surviving every day. He told me that this particular image was a reflection on the bathroom being the only area of complete privacy when living in shared spaces. As the daughter of a Beiruti, Aya Haidar’s neon light piece at Athr found a special place in my heart. The work first flashes to say “I love you as much as”, then a second time to add “as the power cuts daily”, a tongue in cheek comment on the power outages in Lebanon. 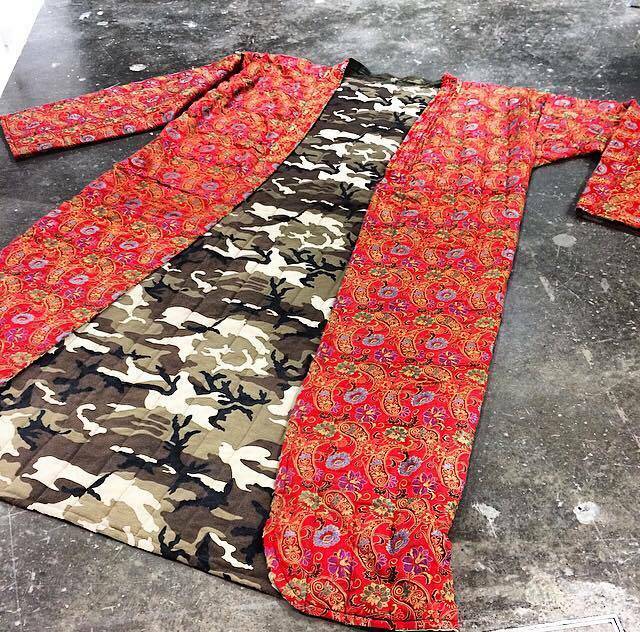 This textile work presented by Kazakh gallery Aspan references the history of Ghengis Khan. 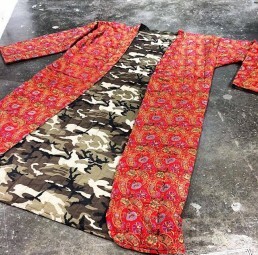 Ghengis Khan’s Clothing in Otrya brings the historic figure into the 21st century, enlarging the garment to match his larger-than-life mark on history. Displaying it lied on the floor, shows how Ghengis Khan’s legacy still lingers. 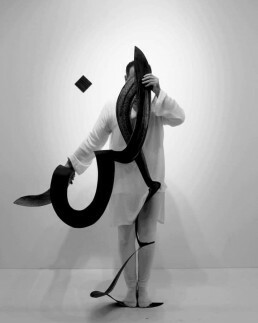 Represented by the Jordanian Wadi Finan Art Gallery, Bounoua‘s series of photographs Situations: Project 01, show a figure interacting with and hiding behind Arabic calligraphy. The performance-based photographs almost look like a dance, with the letters being put centre stage in front of the male figure. 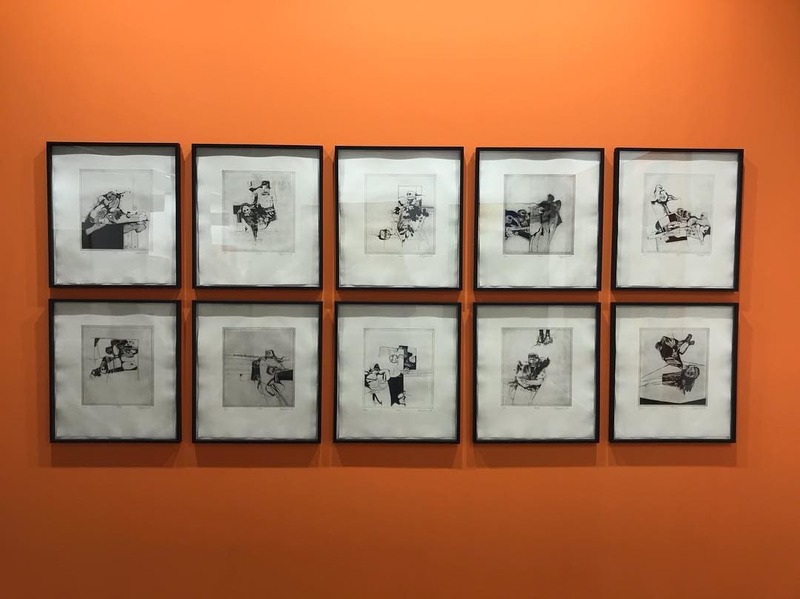 Meem presented a set of ten etchings by Dia Azzawi. 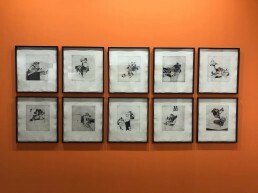 Produced in 2018, they are based off of drawings originally produced by Azzawi to accompany writings by Palestinian writer and activist Ghassan Kanafani. 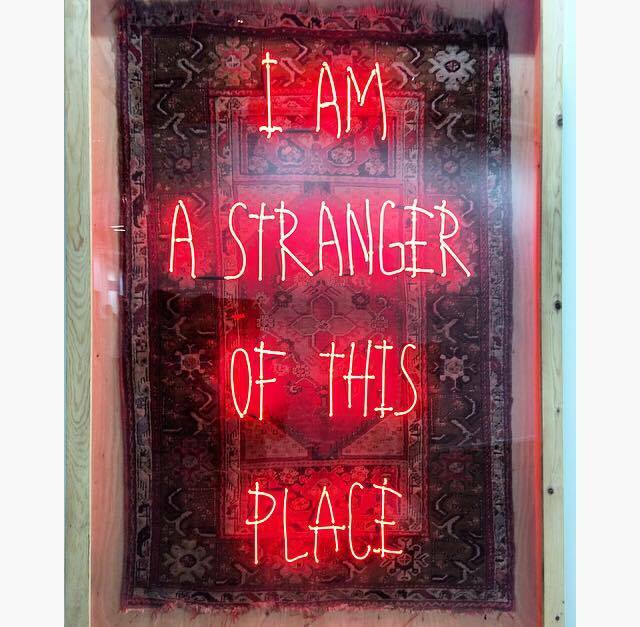 Combining carpet with neon lights, Ramazan Can’s work mixes history with the future. Exhibited at Anna Laudel, the work was trapped behind a heavy glass frame, the rug in question has been contained in a space where it feels foreign. Read more from Lizzy Vartanian Collier.